It's hard not to be taken by this product. It may not look as flashy or be as well built as some of the brand names, but it packs many useful features that make it enticing. It's representative of what the bigger brands should be including with their 2-in-1 devices. Pick it up from Aldi on 1 October if you want a basic Windows 8.1 machine with good versatility. You might scoff at the way the Medion Akoya P2214T (MD99430) looks — as did some people in our office — but if you can find another 2-in-1 Windows 8.1 hybrid device with a Full HD screen for under $550, only then will your scoffing be tolerated. It's hard to find the same level of value in other machines at this price point that you do in the Medion, and this is the strong point of the brand that we’ve grown to love: it gives you plenty of bang for your buck, not to mention it can be picked up while you’re doing your grocery shopping. This one goes on sale at Aldi on 1 October with a price of $549. The main thing to note about this hybrid is that it’s a regular clamshell notebook with a removable screen that can be used as a tablet (that’s the 2-in-1 functionality). It’s an 11.6in tablet with a touchscreen that features a Full HD resolution, and Medion states that it uses an IPS-like (In-plane switching) technology called Advanced Hyper-Viewing Angle (AHVA). The high resolution gives you plenty of room to view Web pages, and a nice width for lining up windows side by side when you’re in a productive mood. Meanwhile, the AHVA technology, like its descriptive name suggests, allows the screen to be viewed easily from any angle at which it’s held. This was the case during our tests, and we found it to be a crisp and rich screen overall, with minimal backlight bleeding noticeable from the corners visible while watching widescreen videos that didn't take up the whole screen. All of the processing power resides in the tablet, and you get a Celeron N2940 processor at the helm with a generous 4GB of RAM, and also 64GB of internal flash memory. Our Blender 3D rendering test took 1min 30sec to complete on this tablet, which is a 20sec improvement over Medion's previous hybrid, the Akoya P2212T. That stands to reason since the new Akoya's CPU is one step up from that. It’s a configuration that makes the unit feel zippy for basic tasks, so you can use it quite easily for common Web browsing and online communications tasks without it seeming to drag its feet. That said, if you encounter Web sites that require a lot of processing, such as those with lots of scripting and Flash elements, then it can become a little unresponsive. Video streaming from premium services, such as NBA League Pass, is possible at medium quality levels, but frame rates won't be silky smooth. Even if the CPU has been working hard, the tablet doesn't really get too warm, with only a small heat spot appearing on the right side. You can continue to hold it without any problems. It also doesn't make any noticeable noise, which is always a blessing for a Windows 8-based tablet. The power button is located on the right side at the top, and it can be easy to inadvertently press it if you forget it's there. It's joined by a screen rotation lock switch. The top houses the volume buttons, as well as a button that acts as a shortcut for the Dolby software that's installed — it merely changes listening mode depending on whether you are listening to music or watching a movie. It's unnecessary, but it's there. A capacitive Windows Home key is at the front of the tablet. The integrated speakers (one either side) aren’t of much use for any type of listening, but Bluetooth 4.0 is available, and it allows you to easily connect to Bluetooth speakers or a Bluetooth amplifier. The tablet is capable of streaming music from the Internet (from services such as Google Play Music) while connected to Bluetooth speakers, though the CPU usage will be a tad high and could lead to slower performance while Web browsing at the same time. A small pen with a soft tip ships with the unit (it can be found in a slot at the left side of the dock) so that you can use the tablet for drawing and handwriting. The tablet was a little sluggish at recording full strokes of the pen, with lines sometimes looking disjointed, but for the most part, it was decent for taking notes and little bit of painting. A soft-tip, short pen is supplied with the unit. Connections on the tablet itself include mini-HDMI, micro-USB 3.0, a headset jack, a microSD card slot, and the docking connector at the bottom. You'll need an adapter for the mini-HDMI port if you want to connect it to a TV. We connected it without any issues to our TV using a $17 adapter from Officeworks (specifically, the Comsol Female HDMI to Male Micro HDMI or Mini HDMI AV Adapter). The video and audio carried correctly and allowed us to watch stored video files as well as online streams. The right side has the power button, rotation lock, microSD slot, micro-USB 3.0, and mini-HDMI. The top has the headset port, the volume buttons, and a Dolby mode button. The bottom view of the tablet. At this point, we’ll mention that the Wi-Fi in the Akoya is an 802.11ac module (Intel Dual Band Wireless-AC 3160 with 1x1 antennas). This is another aspect of the Medion that’s pleasing for the price. Many pricier units still stick with 802.11n Wi-Fi, and in some cases even single-band Wi-Fi, rather than offering the latest standard. However, since it's a system with a relatively weak CPU, transfer rates will be erratic. Ours peaked at 15 megabytes per second to our D-Link DIR-880L router, with the average rate being about half that. The CPU usage peaked at about 80 per cent, and the system slowed down noticeably until the wireless transfer was complete. If you plan on copying lots of data across your wireless network, do it during a time you don't need to use the computer for anything else. The keyboard dock has a further two USB 2.0 ports, but it doesn’t have a full HDMI port. This is a bit of a let-down, but as we mentioned earlier, you can still plug the tablet directly into a TV using its mini-HDMI and an adapter. When it’s docked in its keyboard base, the Akoya can make use of an extra battery, and there is a 500GB hard drive that allows you to store all the big media files that might otherwise hog the tablet’s flash memory. It’s worth noting that for this reason you can’t just remove the tablet from the base without consequences. If you do, you’ll get a message saying that you haven’t safely removed the hardware. There is a little icon in the System Tray area that you have to click on in order to safely disconnect from the base in a software capacity prior to removing the tablet. It will ensure that data in the process of being written to the hard drive isn’t lost. 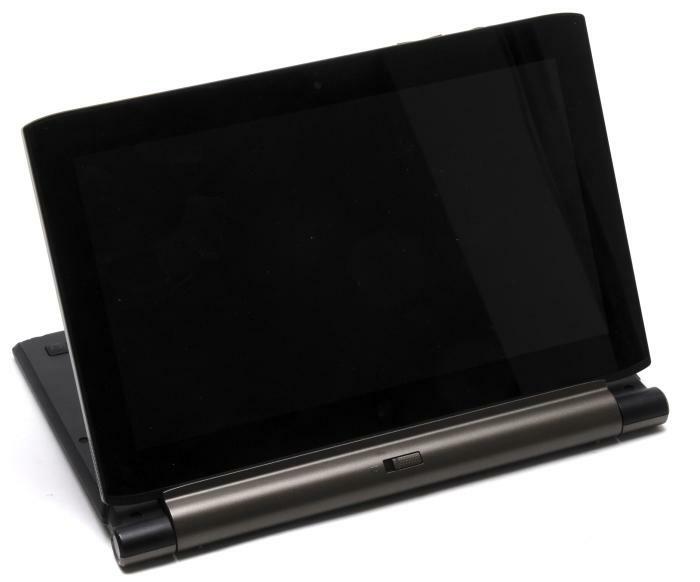 The hinge release mechanism is hard to get a grip on and this can make it awkward to release the tablet from the dock. The battery in the base is used before the battery in the tablet, and the tablet’s battery is charged first when in notebook mode. 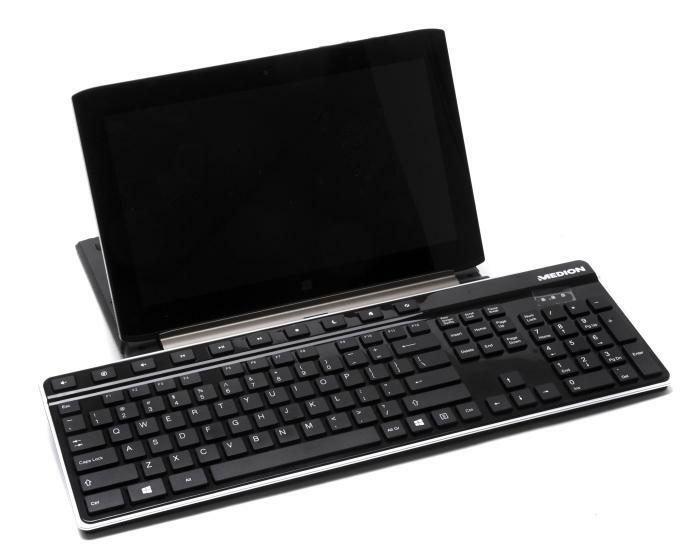 This is by design so that you mostly have power for using the tablet independently of the base. During our rundown tests, in which we disable power management, enable Wi-Fi, maximise screen brightness, and loop a Full HD MP4 file, the Akoya lasted 7hr 57min when docked, and 4hr 11min when used as a tablet. When used as a notebook, the Akoya feels well balanced; the tablet doesn’t want to tip over backwards like it can on similar units, including Medion’s previous 2-in-1 model. However, since the hinge allows the screen to go all the way back, you have to exercise caution in this area. Medion has made this tablet lighter than the previous model so that the weight difference between the keyboard dock and the screen is greater, and more focused in the dock. On its own, the tablet weighs 707g, the base is 892g, and the overall unit when used as a laptop is 1.59kg. In terms of build quality, the attachment point at the base for the tablet is a little on the stiff side, and when you try to move the lever, that’s when it hits you that this device is still a budget unit. It’s definitely a little fiddly to work with, but if you won’t be removing and re-docking the tablet on a regular basis, then it’s not too concerning. You also should make sure that you handle the tablet with respect. Don't put too much force on the back (it flexes noticeably), and don't try to bend it. Typing with the keyboard dock is a mostly comfortable experience; it’s a bit of a rattler, but it gets the job done. Most importantly, Medion has improved the layout of the keyboard compared to the previous model. On the previous model, the physical keys were laid out in a UK style, with an angled Enter key, a small left Shift key, and some wayward slashes. The keyboard on this model has a standard US-style physical layout that we’re all used to in Australia, so you don’t have to re-learn how to type, or re-map any keys. On the right side is the keyboard for this model. On the left is the keyboard layout for the previous model. You can see that the new model is a little bigger, owing to the new hinge, and also slimmer. A touchpad with support for multi-finger gestures and Windows 8 swipe-in gestures is present, and while it worked mostly accurately for us, we did face one large annoyance: the scroll direction for the two-finger scrolling gesture often reverted back to the ‘reverse’ setting, even though we had unchecked this box so that the page would scroll down (rather than up) when we moved our fingers down. 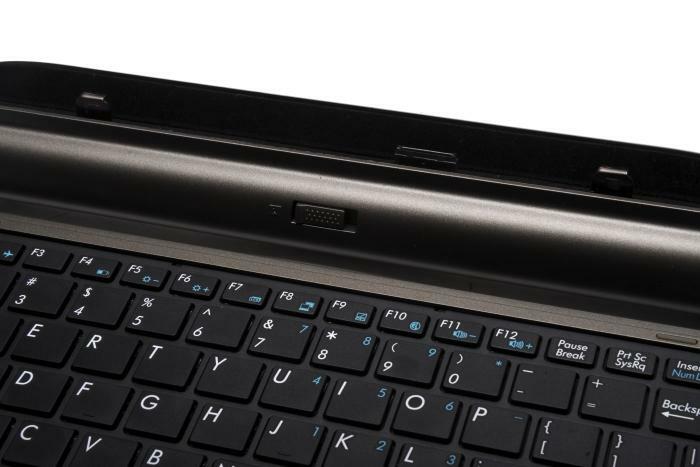 In addition to facilitating notebook usage, the keyboard dock allows the Akoya to be used in ‘stand mode’. This is due to the hinge, which can rotate the screen all the way to the other side and stand it up as a display. And then around, to facilitate display mode. This comes in handy when watching videos. Comfortable to use it as a desktop for long typing sessions. In this arrangement, the keyboard is out of the way behind the screen, and the screen takes prominence. It’s a great way to watch videos without holding the unit, and it’s also great for using the unit as a desktop. You can put a full-sized keyboard right up against the screen, which makes for a comfortable typing experience. It's hard not to be taken by this product. It may not look as flashy or be as well built as some of the brand names, but it packs many useful features that make it enticing — the wireless AC standard for one, and a micro USB 3.0 port for another. It's representative of what the bigger brands should be including with their 2-in-1 devices. Not only does the Akoya work well as a Windows 8 tablet, the dock turns it into a laptop that doesn't make it feel too much like a two-piece product. Furthermore you get an extra battery in the dock, you get extra storage, and you get the special hinge. The only drawbacks are the touchpad driver not holding its settings, the awkward physical mechanism for releasing the tablet, and average build quality.